After Aiding Injured Israelis, A Palestinian Is Targeted For Abuse : Parallels When an Israeli family was ambushed in their car in the West Bank, two Palestinians came to their aid. One is paying a price now, seen as aiding the enemy. 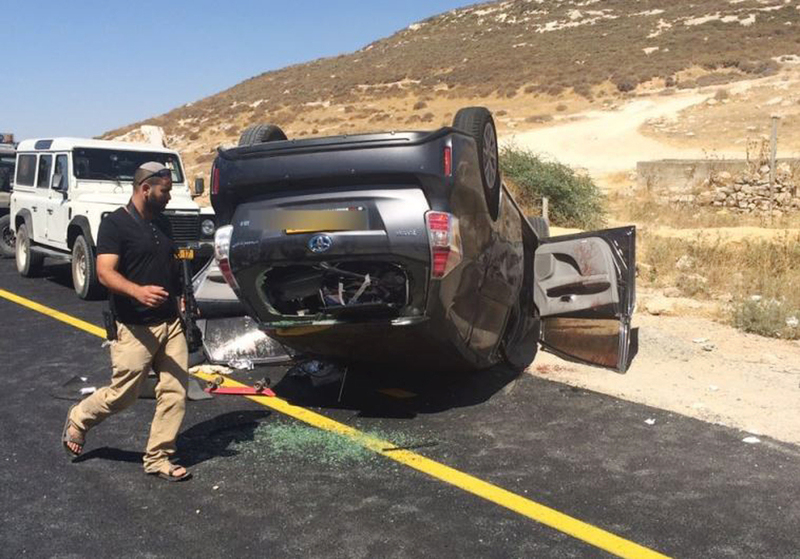 An Israeli security officer next to an overturned vehicle belonging to a family of Jewish settlers ambushed near Hebron, in the West Bank, on July 1. Two Palestinians aided the wounded Israelis. One of the Palestinians has since lost his job and been targeted for abuse by fellow Palestinians. In a modest Palestinian home outside the West Bank city of Hebron, two parents try to protect their son, urging him not to tell his story, saying it's too dangerous. He is 28, has scars on his arms from a motorcycle accident and wears a baseball cap. His smile is bashful. He politely parries his parents' pleas and says he wants to talk. But he asks NPR to withhold his name and his exact location. He says he could be killed if his critics knew he had spoken to a reporter. His story is about being a victim of violence in the Israeli-Palestinian conflict, but not because he was a target. In fact, he was a savior. And what unfolded after a single act of violence he happened upon — a twist of fate, his mother believes — helps reveal the levels of mistrust between Israelis and Palestinians, the level of discord within Palestinian society and how, in this conflict, even acts of humanity can be considered political. On July 1, on a road not far from his family's home, the 28-year-old Palestinian became a rescuer. He and his wife were driving when they came across an overturned van. They stopped and rushed over and saw a family of Jewish settlers who had been ambushed by a Palestinian militant. In the back seat, the 15-year-old son was screaming. His 13-year-old sister sat next to him, wounded badly in the abdomen. Their mother, Chava, was in the driver's seat, hanging upside down, her seat belt wrapped around her neck. A bullet had grazed her skull, and she was gasping for air. In the passenger seat, the father, Rabbi Micky Mark, had been shot dead. The van, like those driven by many Jewish settlers, had plastic windows that the rescuer couldn't break. He managed to wrestle the back door open and free the daughter, trying to reassure her. "Don't be afraid," he remembers telling her. "Don't kill me," she replied. He carried her to his own car and placed her in the back seat, where his wife, who has an undergraduate nursing degree, started to treat her. He returned to the Mark family van and pulled the boy out. "I wanted to take them to the hospital," he said, "but I was worried the Israelis would think I had kidnapped them." That's when another Palestinian, Dr. Ali Shroukh, arrived. "I stopped to help," he told NPR. "I'm a doctor. It's my duty." Shroukh is a urologist in the nearby city of Dura. He refers to the first Palestinian rescuer as his "brother." "I want[ed] to help," he said, even though "it was so dangerous for me and for my brother." Yochai Damari, the head of a Jewish settlers' council in the West Bank, has asked Israel's government to assist a Palestinian who helped a settler family after they were shot. The Palestinian lost his job. Both Palestinians feared Israeli soldiers, who they knew would arrive quickly and could mistake them for the attackers who ambushed the settler family's car. But they both went back to the car to help Chava Mark. They gingerly released her seat belt from around her neck, and set her down on the pavement. "Maybe [that] one minute gave her the life," Shroukh said. "We give her her life." The rescuer remained with Chava Mark, while his own wife and Shroukh tended to the daughter, suffering from a puncture wound in her stomach. They tried to stop the bleeding. "I told her, 'Don't worry, don't worry, everything will be OK,'" Shroukh said. After that, she was quiet. "I have tears for this girl. Because she had seen what had happened," Shroukh said. She had watched her father die and her mother get shot. "Here, in the children, there are no politics," Shroukh said. "Just emotion. She is like my children." Shroukh stops to compose himself. "We are people which we have to live together," he said, referring to Israelis and Palestinians. "You have to help me and I have to help you. Maybe there will be another accident in a Palestinian car. If I will be in their situation, just help me and help my daughter. Help my son." Back on the road, the ambush scene was attracting other Palestinians. Some of them criticized Shroukh and the rescuer for helping Jews who settle in the West Bank, land that Palestinians hope will be part of their future state. One of the Palestinian critics even threatened Rabbi Mark's two children. The first Palestinian rescuer said he defended the kids with ferocity. "If any of you approach my car," he recalled saying, "you will see what I am capable of. They are under my protection." Israeli medics arrived and took the Mark family away. The Palestinians left, thinking that was the end of the story. But that's when the online hate and retribution began. On Facebook, the rescuer was called "worthless" by a fellow Palestinian. Another called him an Israeli spy and a traitor for helping Jews. His employer fired him. This is why he wants to remain anonymous. He remains about $10,000 in debt, mostly from his wedding, which took place earlier this year. "I'm not afraid of being confronted to my face," he said. "What I'm worried about is being stabbed from behind." This is where Yochai Damari comes in. 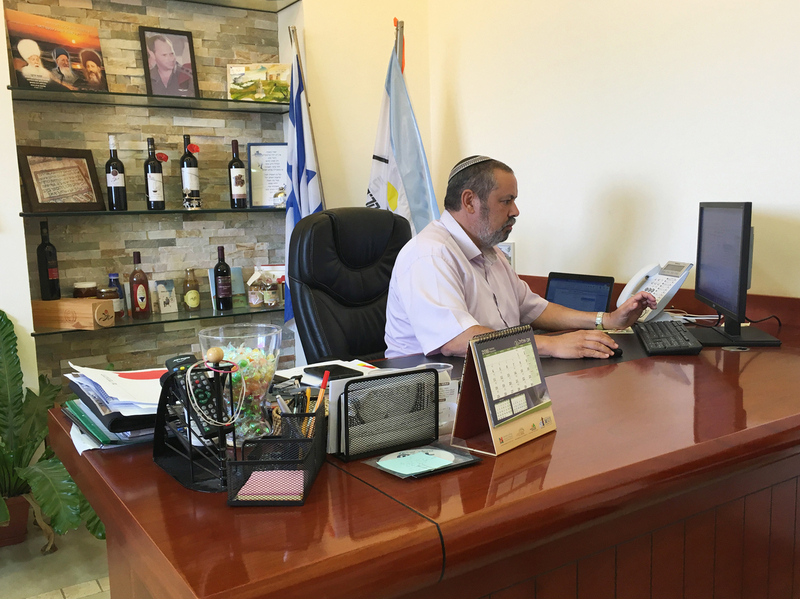 He is the head of the local Jewish settlers' council, and Rabbi Mark was one of his closest friends. "We had been friends for 20 years," Damari told NPR from his office, overlooking a settlement outside Hebron and not far from the rescuer's home. "We would get up every morning and go before prayers, we would study Torah, we would talk about life." Through Damari, the Mark family declined to speak to NPR. Chava Mark lost one of her eyes and spent more than a month in the hospital. Her two children are still recovering. Damari is extremely critical of Palestinian society, and uses dehumanizing language to describe Palestinians. But the personal impact of these events seems to have changed him. He has asked Israel's government to assist in finding new employment for the rescuer. "We live with stereotypes of bad people and good people," he said. "He [the Palestinian rescuer] made sure the Mark children were not kidnapped and were not hurt. It moved me a lot to know that there are people there who don't want to kill us. This is where the stereotypes break, and I think this is very important." Shroukh, who perhaps because of his profession has avoided blowback, couldn't agree more. "I want all the world to see that I am a Palestinian doctor," he said. "Why? Because maybe, maybe, 'A Palestinian doctor, Ali Shroukh, which helped the settlers' — maybe that will change the mind of the settlers and the Palestinian nation to the way to peace. Because we have to live here. They will not go out, and we will not go out. So we have to live together." Living together hasn't been easy for the Palestinian rescuer or his parents. The conversation with NPR about what he had done was into its second hour when his mother interrupted. She said she was no longer afraid of her son telling his story, she explained, because it was fate. Earlier this year, her son had been in a very bad motorcycle accident. She pointed to the scars on his arms. His motorcycle ended up crushed beneath a van, and his heart stopped for two minutes. When the doctor called her, she said, he told her that her son was about to die. "I rushed to the hospital and I looked at him," she told NPR. "He was badly injured and I said, 'Get up, get up. I want you to help people. You are a good person. Live in order to help others.' My son helped others. My son lived in order for others to live." He is alive, as is Chava Mark and her children. But the rescuer now has more scars than can be seen on his body. He says he is plagued by the specter of future violence and the concern that stereotyping will prevent Israelis and Palestinians from seeing each other humanely. He said he feared the controversy meant the cycle of violence and retreat into stereotypes would continue. "I will always help. And even if I need to expose my life to danger, I will help again," he said. "Humanity is separate from politics. I want my people [Palestinians] to be like me. I didn't hesitate. They shouldn't hesitate." There is one more family involved in this story. Three weeks after the incident, the Israeli military traced the suspected Mark family attacker to a home in the village of Surif. The suspect, Muhammad al-Fakih, fired on the Israeli forces, sparking a shootout, according to the Israeli military and witnesses. Soldiers then bulldozed the house, killing him. Fakih's wife Hadeel Odeh, who was not with her husband at the time, was six months pregnant. The final paragraph of the online story clarifies that Palestinian Muhammad al-Fakih was killed after a shootout with the Israeli security forces, according to the Israeli military and witnesses.